I must admit that I’ve tried to eat kale many times in my life. I KNOW how good it is for me, but like many vegetables can be it has a distinct and somewhat bitter taste. I just couldn’t do it. Most people recognize it as the fake, dark green lettuce looking stuff they throw on plates at a restaurant as “garnish”. Once we decided to give up meat as of January, I was committed to trying new foods and old ones that I had previously scoffed at in order to be the healthiest I can be. I had to find a way to make them tasty. This recipe that I found is what converted me. 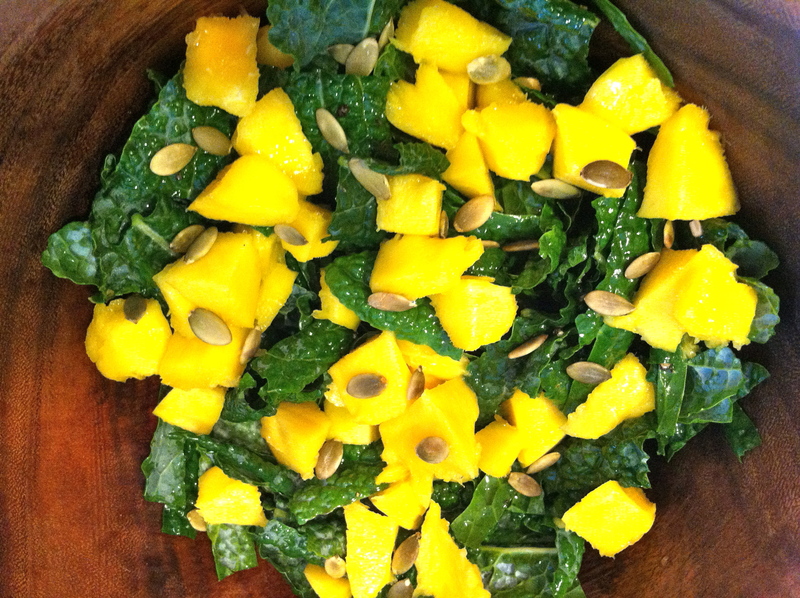 This salad makes me eat kale and LIKE it each week, and I’m now eating kale chips too. The lemon juice and honey (or agave nectar) soften the kale and take the bitterness out of it. *Kale is packed with antioxidants, and research shows that it can lower your risks of 5 different types of cancer: bladder, breast, colon, ovary, and prostate. *Kale contains lutein which keeps the eyes and vision healthy. *Kale is a great resource for minerals such as copper, calcium, sodium, potassium, manganese, and phosphorus which control blood pressure and iron which controls red blood cell production. Small handful toasted pepitas (pumpkin seeds), about 2 rounded tablespoons ( substitute pistachios, sunflower seeds or whatever I have on hand. You can also use other sweet fruits if you’re not a mango fan. 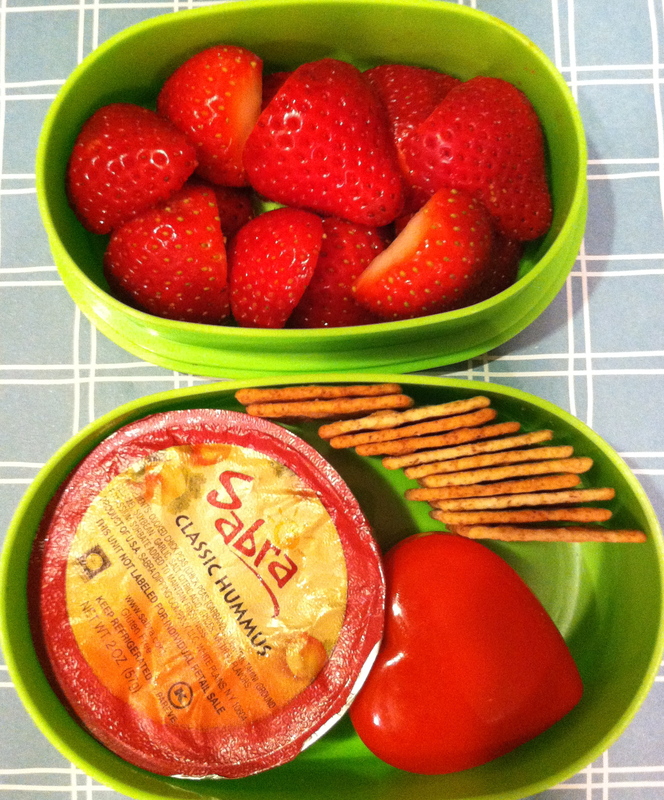 Peaches, strawberries or whatever is in season are also a great substitute. 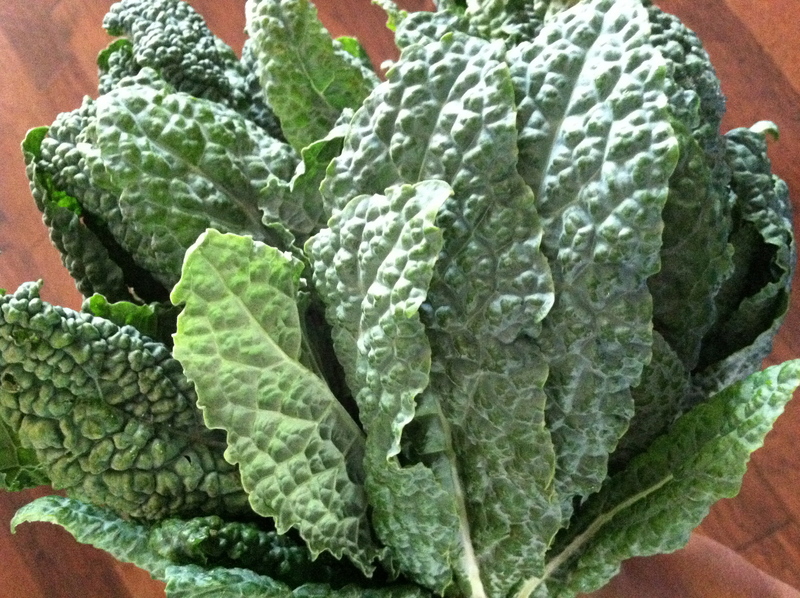 I started with lacinato kale, also known as dinosaur kale that I found at our local King Family Farm and Market. I had to look up the different kinds of kale before hitting the farmer’s market to re-educate myself on the different types of kale. Here’s a link from Eco Localizer that might help you before you go shopping. The salad will taste better if you cut off the branchy ends of the kale and remove the spines after washing it. Then I just cut the pieces into bite size and toss in the bowl. 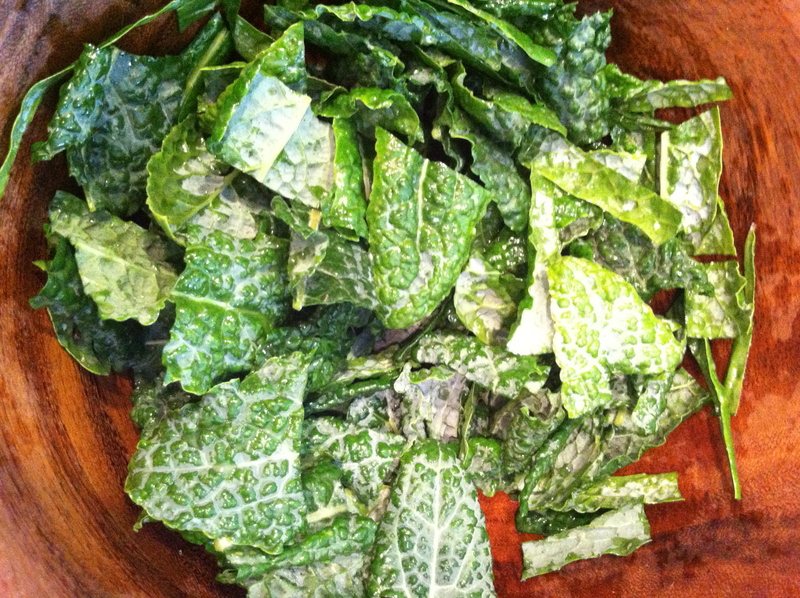 In large serving bowl, add the kale, half of lemon juice, a drizzle of oil and a little kosher salt. I minimize the oil because of calories from fat (100% of the calories in any oil come from fat). Massage until the kale starts to soften and wilt, 2 to 3 minutes. Set aside while you make the dressing. In a separate, small bowl, whisk remaining lemon juice with the honey (or agave nectar to taste) and freshly ground black pepper. Add oil while whisking until a dressing forms, and you like how it tastes. Then top with the cut fruit and seeds of your choice and enjoy! My girls are learning about Florida today. Miss G was asked to dress like a tourist at preschool to celebrate things about our state. Since I recently did two lunches showing where the state is, I decided to make things that they like & see often. The mockingbird is our state bird. We feed the birds at our house, and a mockingbird sits atop the large oak tree in our front yard and sings most days. It imitates the songs of many other birds so it’s pretty to listen to. They are also fierce protectors of their nests so if we (or the dogs) get too close, they will swoop down & chirp at us to give us a warning. The mockingbird is made from Rudi’s Whole Grain bread. And the wings and tail feathers are the heel of the loaf. Its eye and beak are made from fruit leather. His leg & tree branches are made from pretzel sticks and the leaves are unsalted pumpkin seeds stuck on with almond butter. 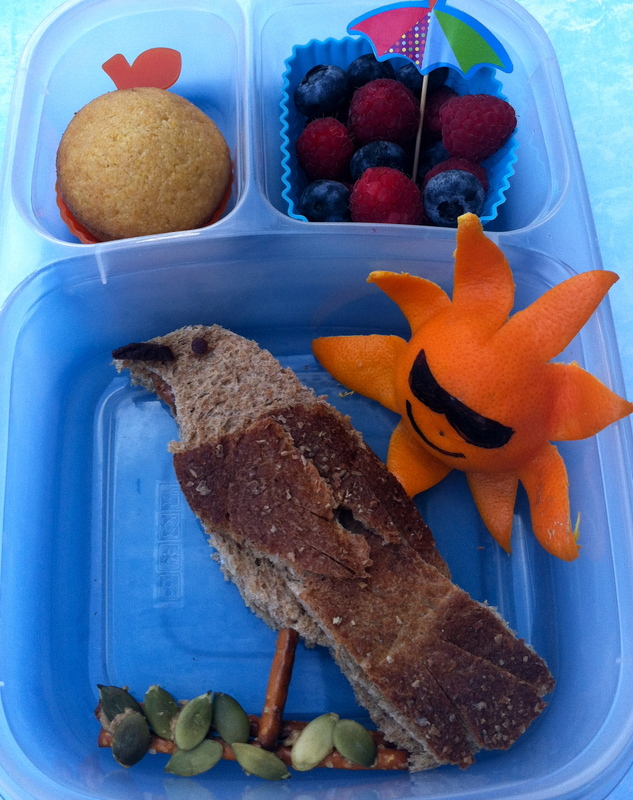 Next to the bird is a mandarin orange peeled at one end to make a sun since Florida is the Sunshine State. At the top left in an orange cup (the orange blossom is our state flower) is a cornbread muffin and at the top right are locally grown blueberries from King Family Farm and Market and organic raspberries with an umbrella pick. 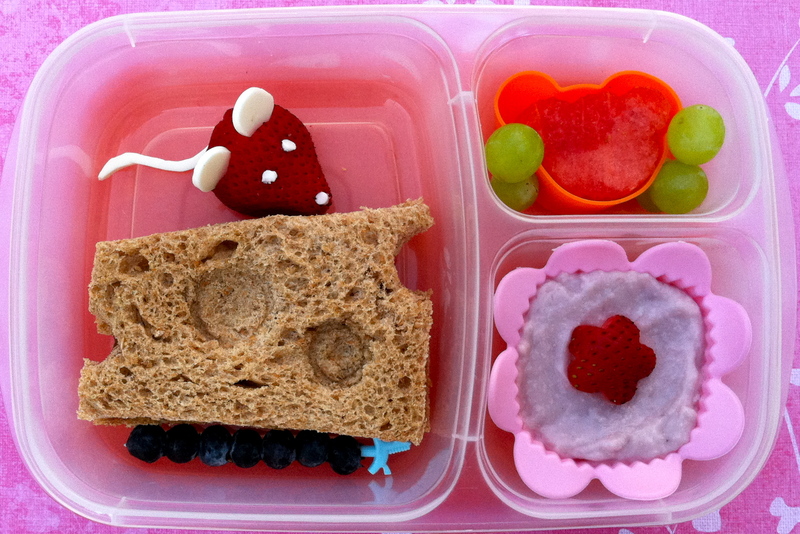 Her lunch is packed in an Easy Lunch Box. And Miss A gets a flamingo today. Flamingo “stuff” is sold in every tourist shop in our state. When I first visited Florida over 20 years ago, I was shocked to not see one flamingo. They aren’t native here, but we see plenty of them at our local attractions. If you’re visiting here, Sarasota Jungle Gardens is a fun place to visit in Sarasota. They have many flamingos that walk around the grounds, and the kids can hand-feed them. They are also at the Tampa Lowry Park Zoo where we spend a lot of time. So even if they’re not native, we do get to see them often. It is a rare thing if we see them anywhere in the wild, and in fact they are mostly in the Florida Keys and Miami area. Other than that you won’t really see them here if you’re here for vacation. 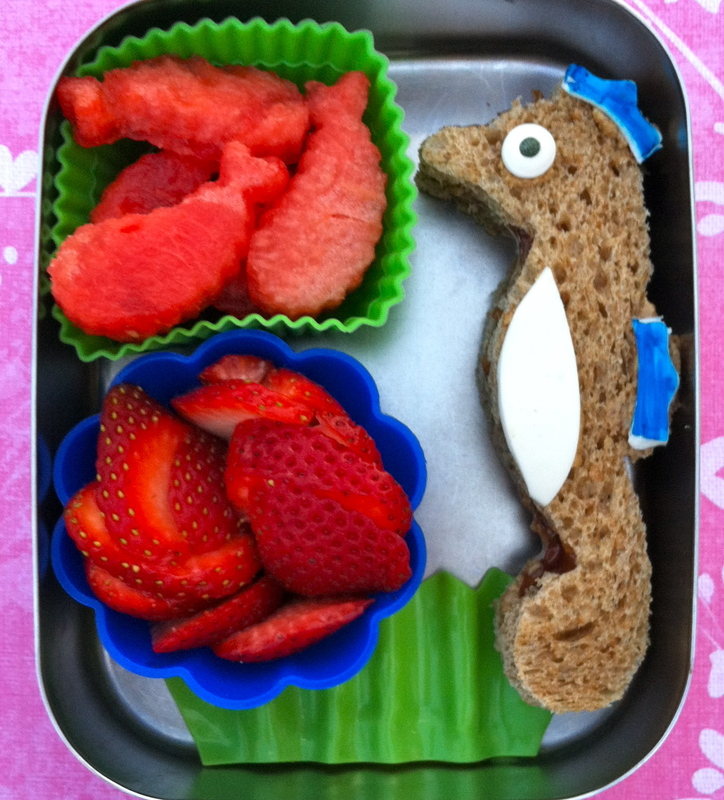 Miss A’s flamingo was made of the same Rudi’s Whole Grain bread. I stuck some pink sprinkles on with agave nectar. The state tree of Florida is the sabal palm (also known as the cabbage palm) so her palm tree trunk is made from dates and coconut flakes, and the palm fronds are honeydew melon. 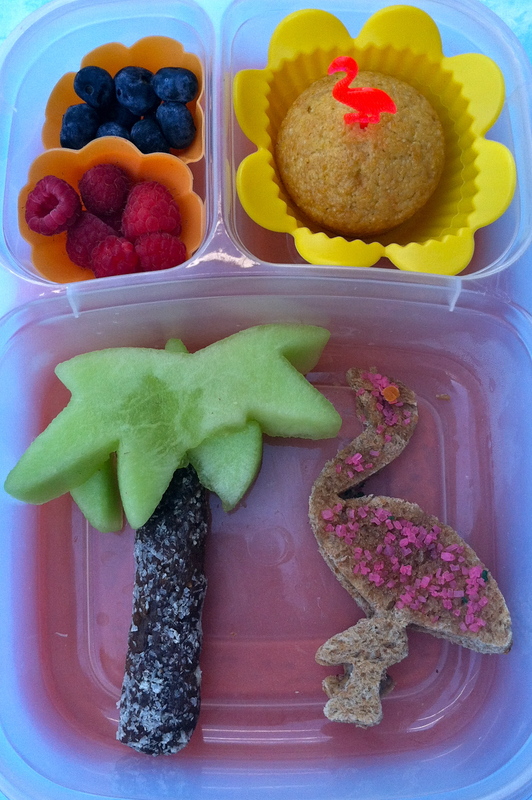 At the top left are orange blossom cups with blueberries and raspberries, and at the top right is a mini cornbread muffin with a flamingo pick packed in her Easy Lunch Box. School’s almost over for us. It’s hard to believe since the days drag, but the weeks fly. This week is a continuation of Under The Sea theme. 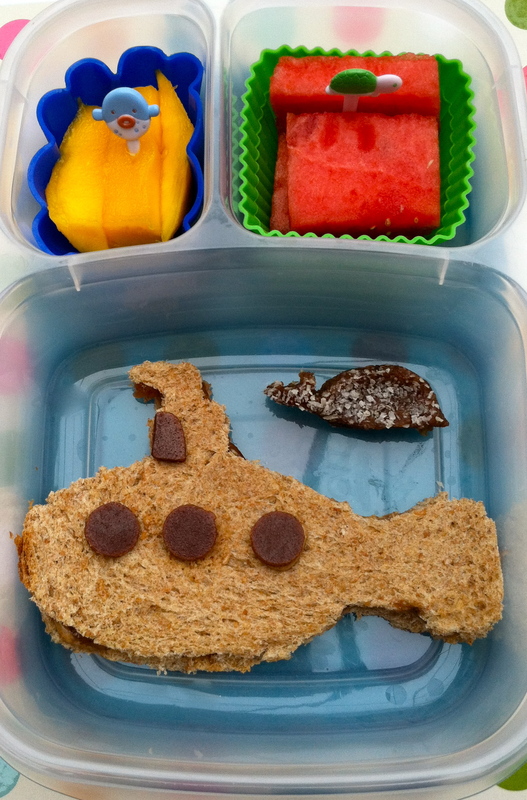 Miss G requested a submarine. I have to admit it would be one of the last things I ever would have come up with. It was so creative that I agreed. She has a Justin’s Almond Butter and jam on Rudi’s Whole Grain bread. I used a rolling pin to flatten the bread before hand cutting the submarine. It has fruit leather portholes. She has a date whale with coconut flakes on top next to the boat. 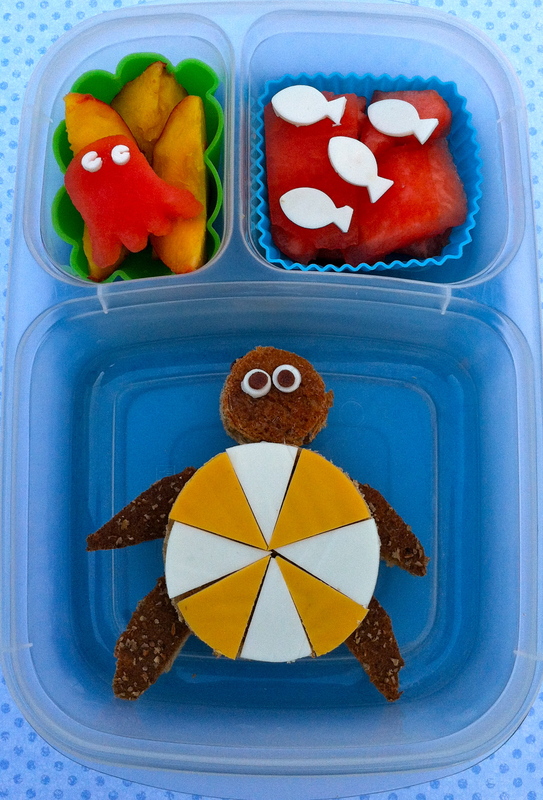 At the top left are mango slices with a blowfish pick and at the top right are watermelon slices with a small sea turtle pick. I didn’t feel like making 2 subs so Miss A got an octopus today. 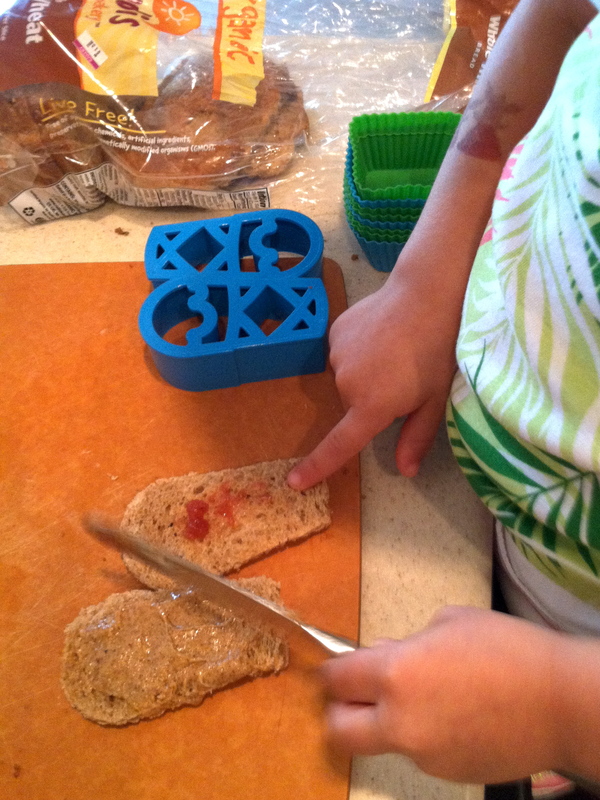 Hers was cut from a biscuit cutter and then I used the biscuit cutter to cut “legs” out of the remaining bread. His hat is a date roll with coconut flakes shaped into a hat. The eyes are candy eyes stuck on with almond butter and so is the fruit leather mouth. At the top left is a mandarin orange with a dolphin pick, at top right are watermelon pieces with an octopus baran (food separator), and in the yellow oval are mango pieces with an octopus pick. My husband has a salad & sides to go with his lunch today. 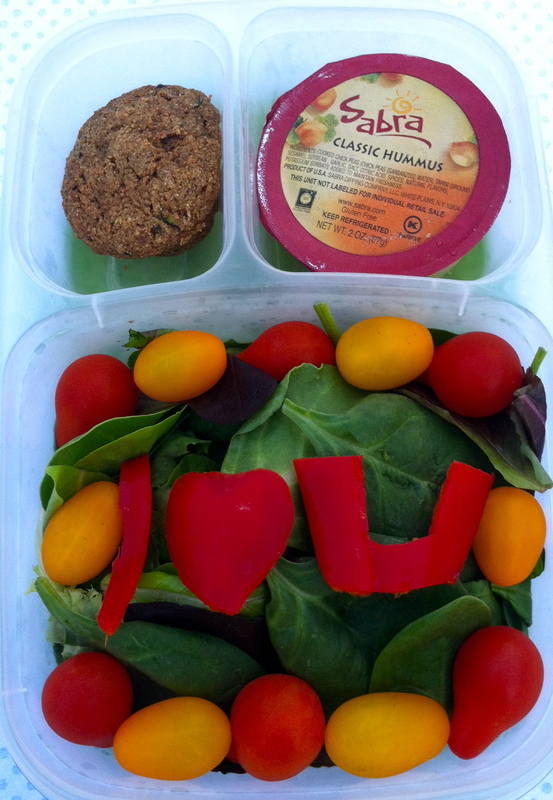 His salad is organic romaine lettuce,with a locally grown, sliced tomato courtesy of my generous neighbor (Thank you! 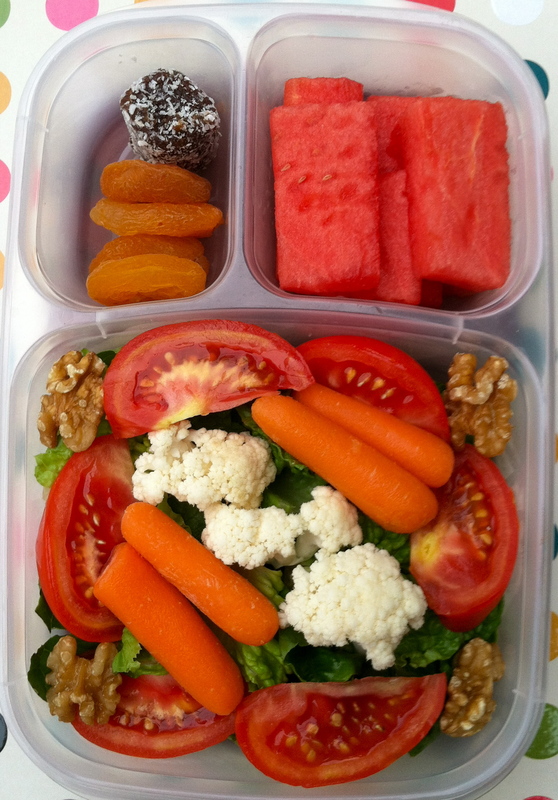 ), unsalted, raw walnuts, mini carrots and cauliflower. 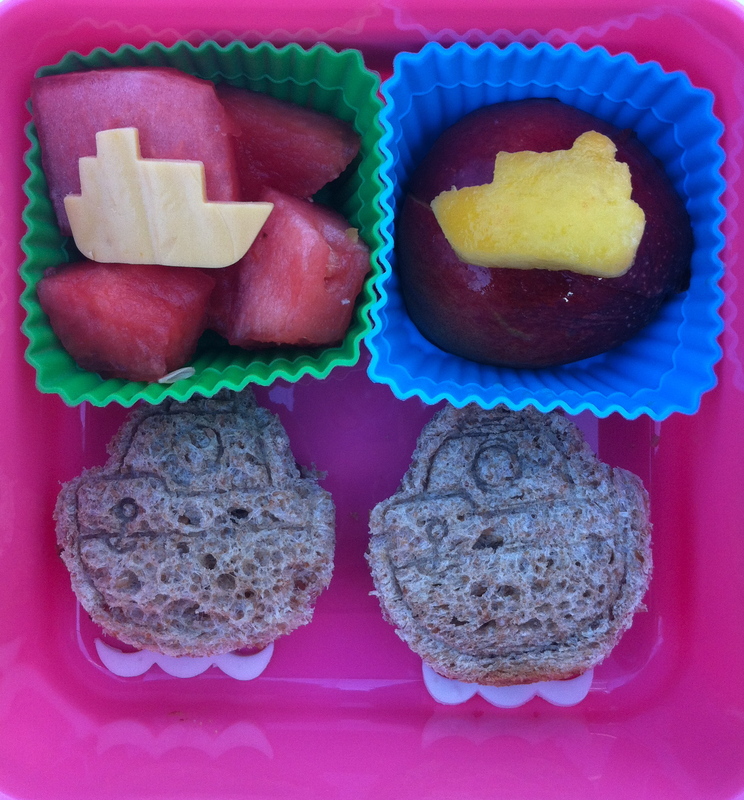 At the top left are dried apricots and a date roll with coconut flakes and at the top right are watermelon slices. 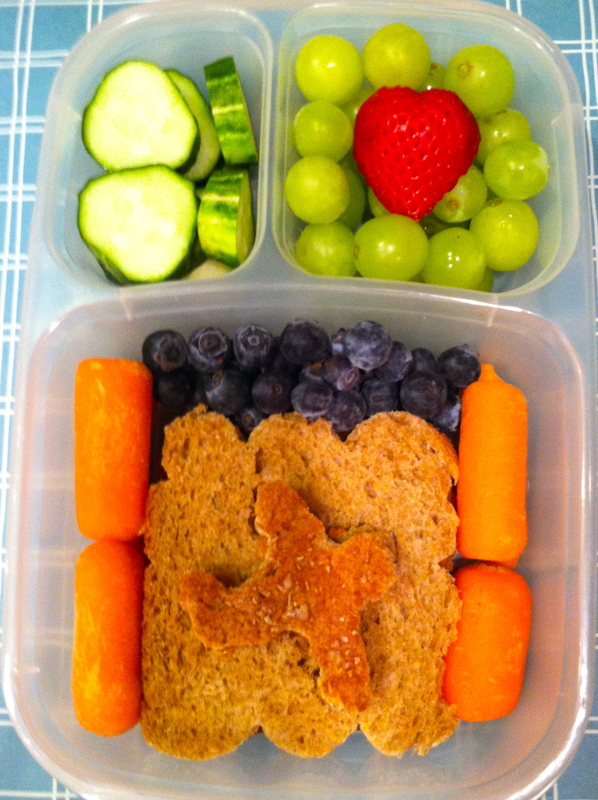 All 3 lunches today are packed in Easy Lunch Boxes. My lovely blogger ladies decided that it would be fun to give dads and/or little ones a chance to pitch in for lunch and give us a hand for a day! What a great idea! So please make sure to push the button at the end of each post to see what everyone’s families did to help mom out for Mother’s Day! My little Miss G is 4. She ALWAYS wants to help. I do love for her to help me, but most of the time the help she wants to give is in the morning rush to finish breakfast, making lunches & run out to school. 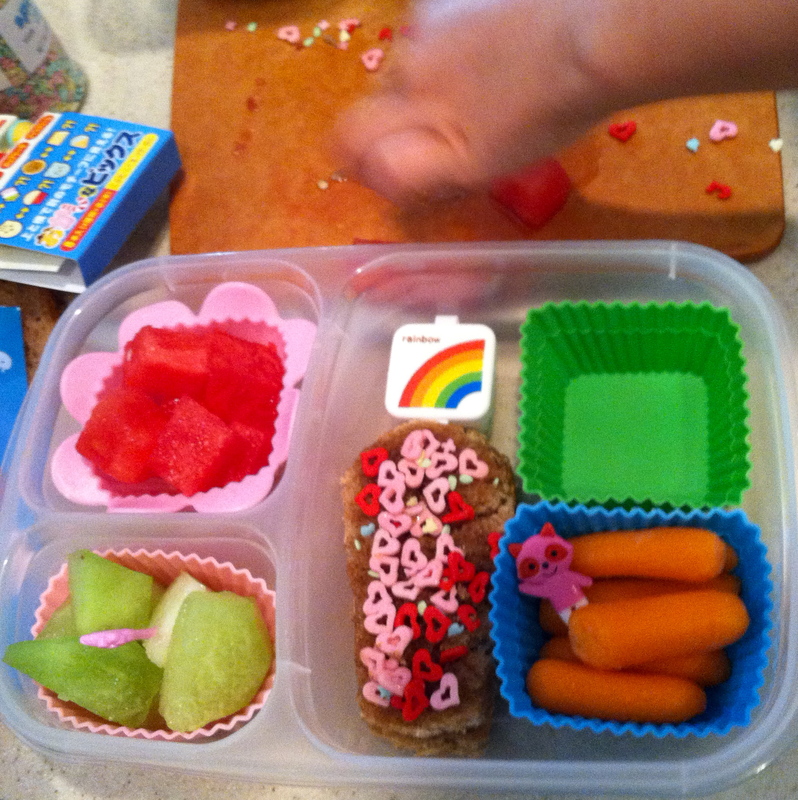 This morning I started her early so she could choose all the things for her own lunch. She chose the ice cream cone shaped LunchPunch for her favorite sandwich shape out of the hundreds of cutters that we have. She also said she wanted LOTS of pink since it is her favorite color. 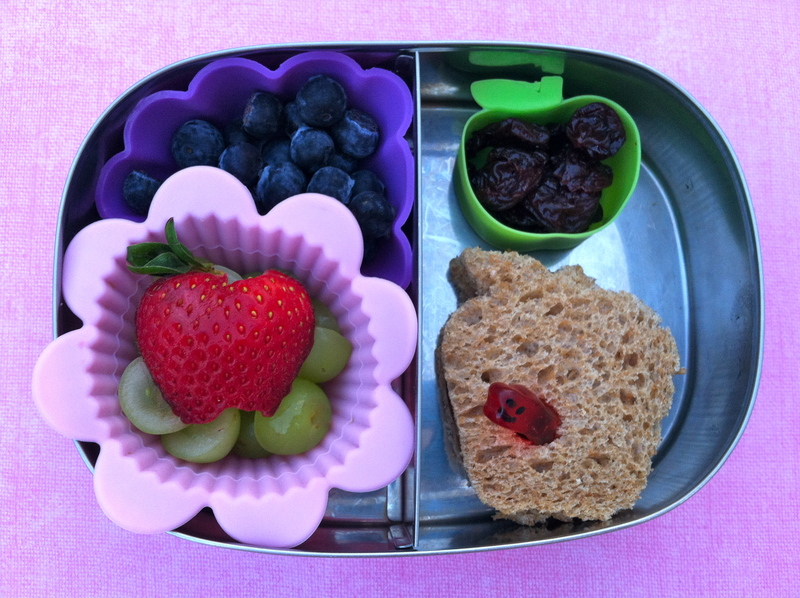 She filled her smaller compartments in her Easy Lunch Box with 2 pink silicone cups , cut her sandwich shapes out of the loaf of Rudi’s Whole Grain organic bread and asked for her favorite standard, Justin’s Almond Butter & raspberry jam. She was surprised that it was tough to spread the almond butter without ripping the bread. I let her choose which fruits & vegetables she wanted. She chose the picks and put it all together by herself. She said she wanted a lot of pink sprinkles, and I told her she could just for today. She even knew that she needed honey (agave nectar) to make them stick. I had to laugh. I think I’m so special at this, but she has been watching me so intently that the lunch looked an awful lot like something I would have done myself (minus the loads of sprinkles and too much food) and just a tad bit messier than me. 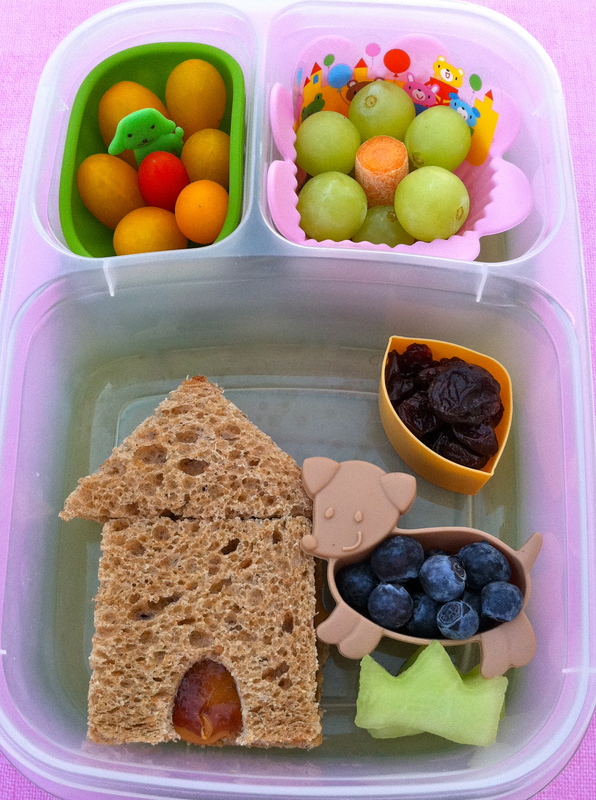 She wanted to choose the background paper herself for the official picture, and insisted that she also take the photo of her lunch too. 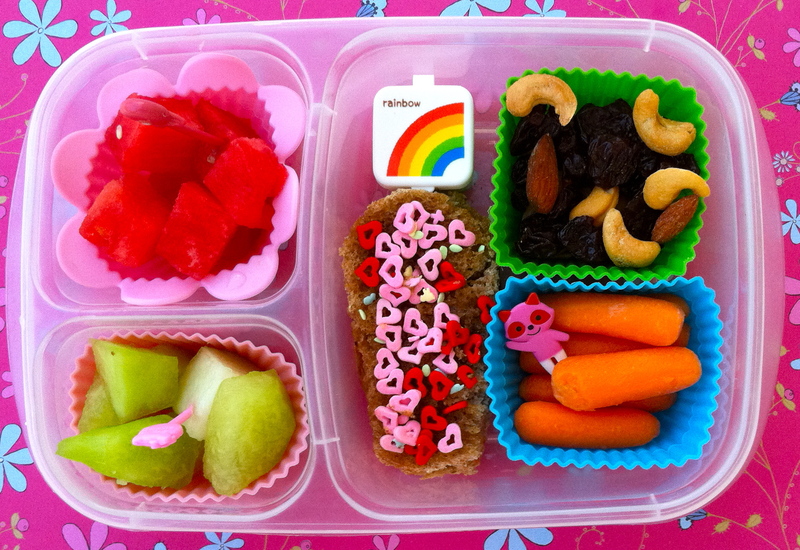 She included watermelon, honeydew melon, mini carrots and threw in cashews and dried cherries in the green cup at the end. She also chose a Hello Kitty pick and a pink racoon pick to add in the end. And here’s the photo I took of her. I’m not including her beautiful, proud face, but know that she has a HUGE smile from doing this all by her 4 year old self! 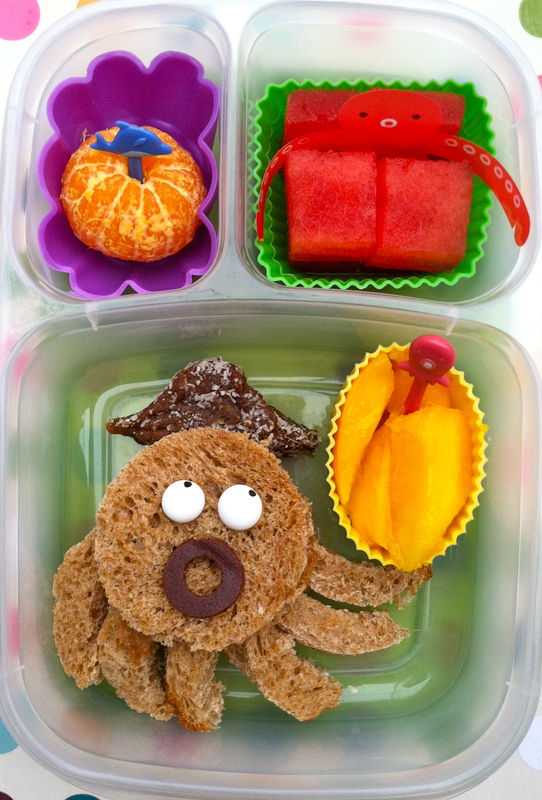 Please hop over to Ludicrous Mama’s page called Biting The Hand That Feeds You to see what her munchkin did for her lunch!